November 2017: the horrid news of a possible explosion and sinking of an Argentinian submarine off Mar del Plata recalls a ghoulishly wonderful English film vividly showing the dangers of life under the sea. Morning Departure was too gritty and sad to be a hit in its day but it is still a highly suspenseful piece, all the more so because it is quintessentially human and so sad. Lieutenant Commander Peter Armstrong (John Mills) is off early for a morning exercise on board his sub. His wife (Helen Cherry) wants him to stop roving and start working at her Dad’s vacuum-cleaner factory (starting from the ground up, as Vice President). I’ll talk to you about it when I’m back tonight, he says (uh-oh). Nigel Patrick, as Armstrong’s number two, rocks-up late from an all-nighter, and eventually, all are gathered for what promises to be a tedious day at sea…till an old World War II mine floats into view. This is the type of stiff-upper-lip stuff the Brits used to do so well, for real and on film. 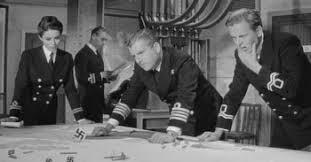 The crew stranded on the sea-bed and those in charge of the rescue are all superb, particularly Mills, Andrew Crawford as a sub-lieutenant, and Bernard Lee as the Commender on board the salvage vessel. 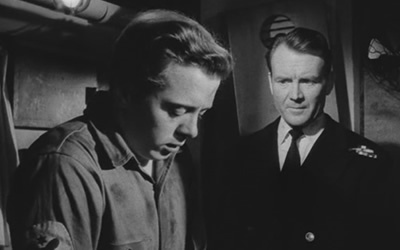 Richard Attenborough plays, impeccably, the cowardly chap who regains honour by the last reel (one of his specialties). “A man in your condition’s got no right to be in a submarine, why did you volunteer.? I needed the extra pay, Sir.